Read this case study to learn how the makers of Duck® Tape leverage product experience management to increase efficiency and grow market share. With a wide range of globally recognized brands like Duck®, FrogTape® and Shurtape® brands, ShurTech needed to develop a more streamlined approach to the ecommerce presence that empowered his team to continually optimize and deliver impactful content to key retail channels like Amazon, Walmart and Essendant. Build and maintain a centralized, consistent and accessible source of production information to arm all divisions of ShurTech with best of class content. Meet and optimize requirements for retailers. 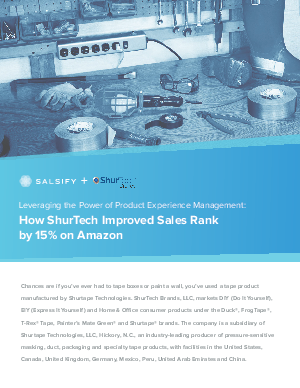 ShurTech uses Salsify to syndicate product information across the digital shelf for their B2C and B2B divisions. Improve product content with action oriented data to increase conversions on Amazon powered by Insights by Salsify.